Is your wisdom tooth troubling you? Or a badly broken/ fractured tooth with roots still stuck in the bone? our surgeons might advise a disimpaction or surgical extraction at times. Surgical extractions/ Open extraction are undertaken if it is not feasible to do a simple extraction or if the clinician considers it to be a more comfortable procedure for the patient. Such procedures may require placing cuts/ incision on the gums/gingiva. 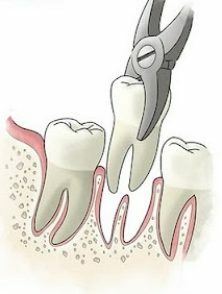 This may be followed by drilling/ guttering of bone and/ or splitting of the tooth to facilitate its removal. At times bone filing/recontouring is also done to remove the excessive bone.